Take your DSLR camera with you on all of your outdoor travel or wild and crazy adventures. This DSLR Camera Canvas shoulder bag keeps your camera protected and your accessories handy, so you can capture those extraordinary moments that happen in a split second. It is especially suitable for digital photojournalists, news, and sports photographers. Take out the inner bag, can be also used as a leisure bag, which sells hot in our store, too. 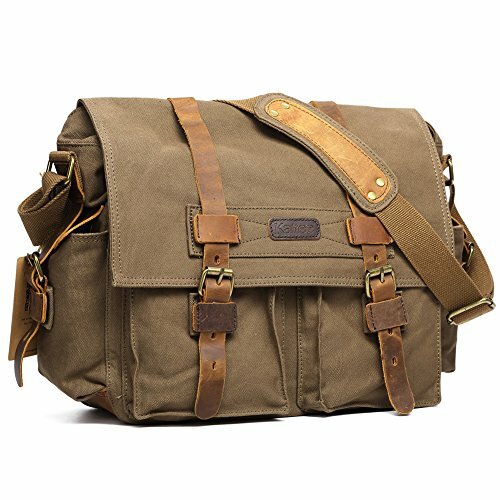 A durable, retro and classical style camera bag with a cotton liner provides complete care for your SLR camera. It comes with brass buckles for quick lock. And it is designed with the cowhide fasteners, metal snap buttons, a big lid and wide should strap for comfortable fit. Put the inner bag into the shoulder bag for easy portability, or fold the canvas shoulder bag into the inner bag against dust and water.